The above figure shows an ERP model. When we say ERP Systems it’s basically the integration of several data sources and processes of an organization in to a unified system with a unified database to store various system modules. Modular software design is the core concept of ERP systems which allows individual components/modules to be added to the system. These modular software designs link into the common database, so that all of the information between is accessible in real time. 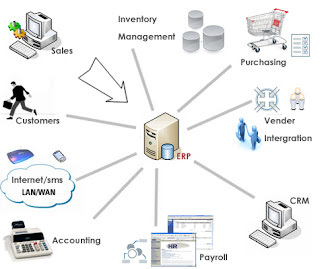 ERP systems integrated separate systems of an organization which led to minimization of specialties in an organization. When most people refer to the “core” ERP applications or “modules,” they mean the back-office capabilities to manage human resources, accounting and finance, manufacturing, and project-management functions. However, major ERP suites from Oracle, PeopleSoft, and SAP now provide much more—including modules for sales force automation, business intelligence, customer relationship management, and supply chain management. We had a practical assignment at university where we had to plan an ERP system for the Sri Lankan Railways. The document is available here. It includes study of the existing system, the proposed system features, the risks and rewards in implementing it etc. I’m sure it will provide a practical view. • In ERP systems, information is often recorded in a form that cannot be read without the use of a computer. • Financial and business information is often generated automatically by ERP systems based on data previously entered, without further human instructions. • Errors that might be observed in non-ERP systems may go undetected because of the reduced human involvement in computerized processing. There is a danger that errors in processing may be applied to a large number of transactions without being noticed. • With proper controls, ERP systems can be more reliable than non-ERP systems. This is because ERP systems subject all data to the same procedures and controls. Non-ERP systems are subject to random human error. Although computer processing will usually be consistent, errors may still occur; for example, if the computer is incorrectly programmed. • But still it is difficult to make changes after an ERP system has been implemented. Therefore, we should be aware of the organization’s plans to introduce significant new systems or to make major modifications to existing systems. It is advisable to review new systems or modifications before implementation so that a preliminary assessment can be made of the adequacy of control procedures, in order to ensure an adequate audit trail, and to plan any necessary changes in the audit approach.